What is a Prescribed Bodies Corporate? A Prescribed Bodies Corporate is the corporation that is responsible for managing, protecting and enhancing the native title rights and interest of a group once there has been a determination of native title. 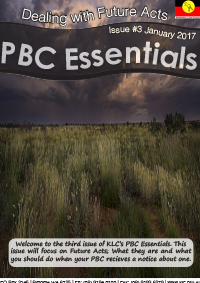 It is a requirement of the Native Title Act to establish a Registered Native Title Bodies Corporate which is more commonly referred to as a Prescribed Bodies Corporate or PBC. The KLC recognises that the role of Native Title Representative Bodies is changing with the emergence of PBCs as more and more native title claims are determined. There has been a high level of demand for the KLC to provide assistance and support to native title holders in the post-determination environment. In theory, the PBC is supposed to take over responsibility for all the functions and activities the regional Native Title Representative Body was doing on its behalf. However, in reality most PBCs cannot carry out those functions due to limited capacity and resourcing. 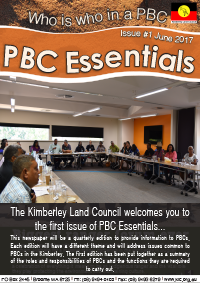 There are currently 13 registered PBC’s in the Kimberley, all at various stages of development. The KLC is also assessing the role it will play in the future and how it can interact with and guide PBCs while ensuring they become independent and successful organisations.